An agreement to share profits from the sale of the former ARC House between the building's owner and the Catholic Diocese of Pittsburgh means the vacant North Side building could soon be sold. The dispute over the rightful claim to the ARC House, a now-shuttered halfway house on the North Side, has apparently been settled. The Catholic Diocese of Pittsburgh will have a stake in its sale. 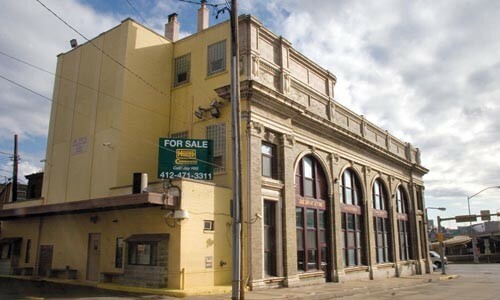 As first reported in City Paper last winter ("Profit from Non-Profit," Dec. 7), ARC House operator Chuck Cain put the East Ohio Street structure up for sale last winter. Cain acquired the ornate, imposing former Mellon Bank building from the diocese in 1987; the property was deeded to him for $1, provided that it be used solely for non-profit purposes, and that it not be transferred to a third party. But Cain sought to sell the property, relatives have said, because the family was in debt. And he apparently didn't notify the diocese of his plans: It took City Paper to bring the listing to the church's attention. Cain declined comment for this story. "We have a legal agreement with Chuck Cain," says diocesan spokesman Father Ron Lengwin. "Some portion of the proceeds will come back to the diocese." Lengwin declined to say just how big the portion will be. But talk of money may prove premature. The building and its surrounding parking lots, totaling almost 6,000 square feet, have been on the market for half a year. Cain initially asked for $3.5 million, but has since brought down the asking price to $1.5 million. Many North Side neighbors are not surprised that the building has remained vacant for so long. Neighbors previously said they hoped something beneficial to the neighborhood -- office space or a recreation center -- would move into the building. However, if the choice were between an empty building and another center like the ARC House, they'd rather keep it vacant. The ARC House was founded in the 1960s as a non-profit program to rehabilitate drug addicts and alcoholics. Several years before its 2006 closing, the program started to house parolees from Allegheny County Jail. Some neighbors contend that the facility became a hotbed for criminal activity. But Jay Hitt, a sales agent for Howard Hanna, remains hopeful. "It's getting closer" to a deal, says Hitt. "I get a lot of phone calls; interest is high in the property. I've been over there [with potential buyers] numerous times." He says potential purchasers have proposed various uses for the building -- ranging from turning it into condos or office space to hosting a social-service agency or a recreation center. "The interest is all over the place," Hitt adds. "Where it ends up, I don't know."